Happy Halloween everyone! Hope you all have a fabulous day and lots treats! ﻿Scraps of Darkness had a challenge to scrap your favorite horror movie. 1. Scrap your favorite horror movie. You can use an image of the movie poster on the LO, an image from the movie, or scrap it any way you choose. 2. Your layout must be at least 50% Scraps of Darkness, and you may enter more than one layout. 3. The contest starts now and entries must be posted in this thread by midnight PST on October 30th. Instead of my favorite, my layout was scrapped in honor of a horror movie that freaked my out the most. I love (really love) horror movies so when The Grudge came out, of course I wanted to see it. Boy am I glad I waited until it came out on DVD. The Grudge had me under the covers, eyes closed, ears plugged. Over the years I have tried to watch it again and again - yet each time is the same. Me freakin' out...someone coming to turn it off. One day I will actually finish it but until then...I'll just scrap it. Again Happy Halloween and thank you for stopping by. 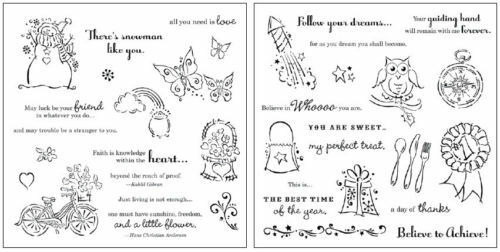 Last week I decided to play along with Simply Betty Stamps because, well simply because I love her images. But of course life gets in the way sometimes or should I say pneumonia (my son and I) gets in the way. It was nice being home but was a terrible way to spend anytime off. So know that my house is sterilized and open for business I am final able to get in my craft room. An owl in a rotten oak tree. Hope you enjoyed the card, thank you for stopping by. Cooler weather has moved in where I live and talk about one happy lady! I love fall and with it the falling temperatures. 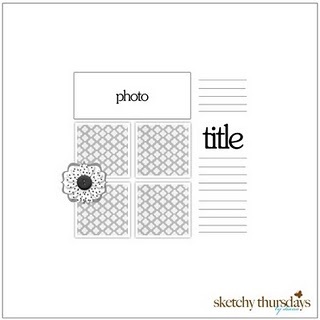 Today I am sharing a simply layout I did using the CTMH Cricut Cartridge Art Philosophy and the coordinating stamps. The above layout was inspired by a sketch from Sketch Inspiration. Thank you for stopping by - comments are welcome and appreciated. Use your scraps & Karber Rubber Clear Stamp or Karber digital. Thank you for stopping by, comments always welcome and appreciated. Hope everyone is enjoying the weekend. A quick post today to show you a birthday card I made for my niece. She turned 12! Thank you for stopping by, comments are welcome and appreciated. Today I have for a layout using a sketch from Twisted Sketches #122. 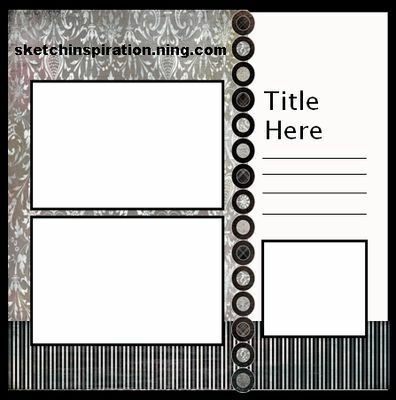 I found their blog a few months ago and I have been inspired by the variety of layouts the Design Team creates using the layout sketch and also the card sketch. Don't just take my word for it, check them out HERE. "TWINE" - any way, any how. wooden stars - gift from Lynn Stevens @ Trash To Treasure. Today I just wanted to show you a card I made using the Close To My Heart Cricut Cartridge Art Philosophy. This cartridge is fast becoming one of my favorites! The stamps are also from Close To My Heart that coordinate with the cartridge. 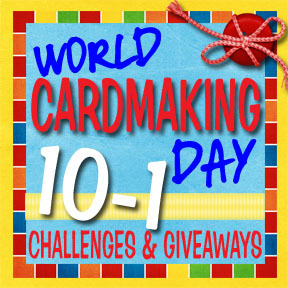 Please check out Tinker Planet's Blog and link up cards, she is celebrating World Cardmaking day all month with special giveaways! Thank you for stopping in - comments are always welcome and very much appreciated. Also today I made this card for the Pixie Dust Studio Challenge - Favorite Movie or Book. If you know anything about me, you know my favorite is a movie and a book﻿...the Twilight Saga, of course! Finally able to fit in some much need craft time. Worked with a sketch from Sketchy Thursdays. Hope you are enjoying the themed hop today with Inking It Up w/Kassidy and I hop you are able to participate in the challenges and giveways. I made a card today using a sketch Kassidy provided. 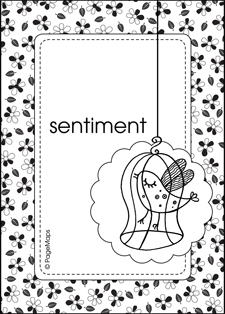 I used Cricut Cartridges Sophie (bird swing) and SweetHearts (sentiment) for my card. The paper is from the monthly kit 'Birdsong' from Scrap That! and the stitching is with Sew Easy. I really enjoyed make this card and I hope that you enjoyed it too. Please hop over to Inking It Up and see all the crafty goodies, challenges and giveaways for today. 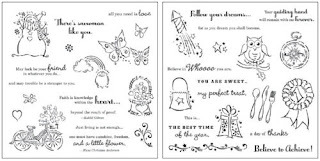 So - how about a little giveaway of my own, the double stamp set from Close To My Heart: Pair-a-Phrase. If you would like to be in the drawing - please leave a comment below and on Inking It Up today. You have until 11:59 p.m. Sunday, October 2, winner will be announced on Monday. ﻿Thank you for stopping in, comments are always welcome and very much appreciated. This is my original work, unless otherwise stated. Please feel free to use for personal use but do not use for publication, contest, message board post, commerical use or to sell. If my work inspires you, please give credit by posting a link to my blog. Thank you!